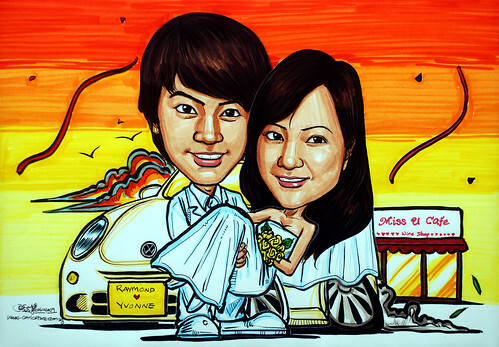 Portrait Workshop - website:www.portraitworkshop.com blog:www.caricature.com.sg: Caricature theme - wedding @ "Miss U Cafe"
a. Change the design of the red car to the one similar to Picture B (Rounder...Cuter). a. Add a restrt on the bottom right corner indicated in green as shown in Picture A. This is quite similar to the restaurant in picture C.
d. She is really pretty so please try your best to draw out her best features!! Don’t do injustice to her :P "
Can't remember which the previous job was. This brief is very long. I have to study every detals carefully. I like most of the stuff drawn, except for the sunset sky. Even if I can, the overlapping strokes will still be too obvious to me. But seems like my clients like the sunset sky.